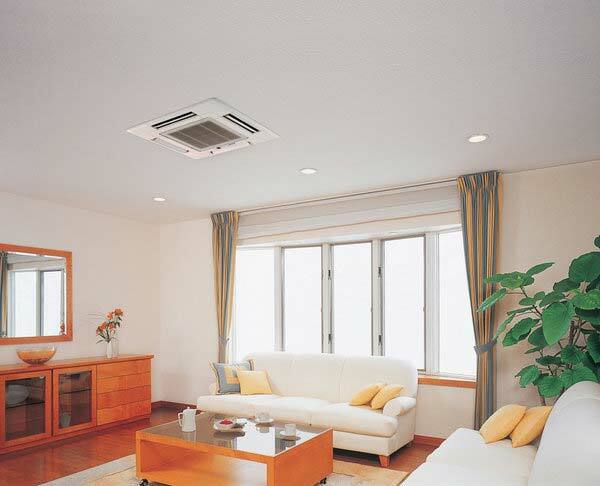 The new Mitsubishi ceiling mounted cassette system offers a smart solution to your home’s heating and cooling. They are compact and don’t take up wall space like a heat pump but give you the same energy efficient, whisper quiet operation we all love from Mitsubishi! The ceiling mounted cassettes are designed to fit flush into your ceilings and with an all new sleek design will make sure they don’t intrude on your living space. One of the advantages of the ceiling mounted cassette systems is how they seamlessly blend into any room. The unit sits flush against your ceiling giving you discreet heating and cooling. The SLZ series is designed in a sleek and stylish pure white colour and benefits from a compact and linear style. The new SLZ series fits into narrow ceiling spaces of just 245mm and has recent been awarded a Good Design Award. The Mitsubishi SLZ series of ceiling mounted cassettes feature the latest technology to keep your home at the perfect temperature whilst also running at optimal efficiency. The 3D i-See Sensor detects the floor temperature and how many people are in the room. It then automatically switches to the optimal settings using it’s eight sensors that rotate a full 360 degrees in 3 minute intervals. The 3D i-See sensor also identifies the location of people within a room and directs the airflow, directly or indirectly – however you prefer.